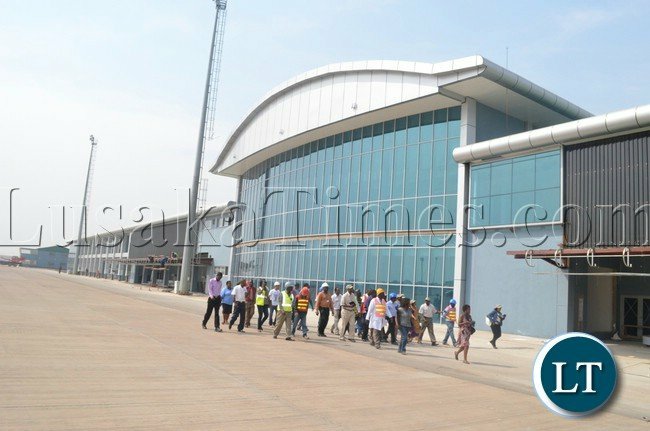 THE Zambia Airports Corporation Limited (ZACL) has expressed optimism that the upgrading of the construction of the international terminal building at Harry Mwaanga Nkumbula International Airport will be completed by September this year. This follows the securing of USD $5 million or K 37million, a commercial loan from ZANACO bank for the completion of the new Terminal Building. ZACL Managing Director Robinson Misitala said aid the Corporation was eager to complete the works by September this year following the securing of funds for the project. Mr Misitala said this on Thursday when he led a tour of facilities at Harry Mwaanga Nkumbula International Airport. He said the major outstanding works were the installation of Elevators, Electrical Reticulation, Installation and Commissioning of the Information, Communication and Technology (ICT) Systems and Builders’ Works. Mr Misitala disclosed that once completed, the new terminal building would have features such as a banking hall, upper floor VIP and business Lounges, upper floor restaurant and viewing terrace, holding lounge, elevators, curtain walling, duty free and retail shops and a water feature outside the front of the building symbolizing the Victoria falls. Other amenities would include electronic advertising spaces, flight information displays, CCTV and access control, modern central air-conditioning equipment, fire alarm system, security agencies offices, smoking lounges, four entry gates and two exit gates. Mr Misitala said ZANACO also financed the initial phase of the project at a cost of USD $7.5million. And Harry Mwaanga Nkumbula International Airport contractor Peter Kapala said the delay of the completion of the works had in the past been necessitated by lack of funds. The old building at the Harry Mwaanga Nkumbula International Airport, which was built in 1952, is currently used for VIP and domestic services. The building will, however, undergo refurbishment under phase three of the project. The terminal building was partially opened for passenger facilitation on 15th August 2013 ahead of the 20th session of the United Nations World Tourism Organisation (UNWTO) General Assembly held in Livingstone in August 2013. Esther Phiri and Sandra Almeda rematch 12th Sept. This is the kind of news we need to hear. But national airports should not be borrowing little money like $5m. Where do you take the money you get from departure fees, plane parking fees and other fees? Oh, I forgot that more money goes into officer’s pockets and into PF coffers. New Airports but old fashion, with No Jet bridge?? (Passenger Boarding Bridge) this is going backward?? Passengers running with Amblers when it’s raining?? think innovative ways to serve customers better.. Damn, its like our ministers never travel. My friend you so eager to hand out loans then contact our silly govt from the article it is evident they are borrowing left, right and centre. We now appear to be in the BS era[Borrowing Syndrome]. A long time ago, we had the DS era[Donor Syndrome] but it would appear this is now going out of fashion as people are in a hurry to get their hands on cash [pronounced as ‘kesh’]. How can one fail to copy this when the ruling elite are borrowing from all directions? There it is Lazy Lungu is clearly broke even a mere $5 million is hard to come by…they empty tins are borrowing left, right centre; this is clearly evident of non planning…this airport is now technically owned by ZANACO. These airports should be operating as semi private companies with their own CEOs, own budgets, own benchmarks and compete with each other; separate from the useless National Airports Corporation. I was shocked to see the new terminal already falling apart. Some sections of the new ceiling and walls are already damaged. It is also evident the works were done in a hurry. How can a building yet to be comissioned already be in such a sorry state? Do these chaps conduct any repairs & maintenance? When is PF Government going to open up Lusaka City Airport again to small aircraft? This used to be the main airport for wealthy tourists bringing in much needed business.